50 mm thrust bearing for mast diameters up to 50 mm, ball bearing design, with 4 installation bolts. The bearing can be used without a mast platform with guys (see drawing); the required support ring to attach the guys are supplied with the GS-050. Small protective metal pieces prevent any damage to the mast when fixing the installation nuts. Mechanical installation as with the model GS-680U, however, mast diameter only 66 mm. Does not fit the rotator platforms! Thrust bearing for mast diameters up to 65 mm, 8 nuts, double ball bearing design. All other data see model GS-050. Diameter of the hole in the mounting platform is 85 mm (see drawing). Heavy duty thrust bearing with tilt compensation up to 5 degrees. Mast diameter 35-68 mm, weight approx. 1.4 Kg. The mast pipe is fixed by means of two mast clamps. Installation holes same as with GS-65. The bearing can be disassembled, so it can be mounted on an existing mast without removing the antennas. Spare screws for those which one looses all the time... anodized steel. Comes complete with nuts, bolts and washers. Replacement of the galvanized nuts and bolts provided for the rotators and mast clamps. This is actually a good idea and almost guarantees problem-free disassembly of the antenna system even after years of use. Comes complete with nuts, bolts and washers. Heavy-duty platform for rotators and thrust bearing up to 60mm rotating mast diameter, fixed mast diameter 50-70mm. Hot-dipped galvanized. Distance from center of mast to end of platform: approx. 275mm. Distance from center of mast to center of mounting position (center of rotor/bearing): approx. 195mm. The thrust bearing GS-050 (Order No. 25020) can not be mounted on this platform! Absorber joints for KENPRO/YAESU rotators; installed in-between rotator and installation platform. Allows compensation of up to 2 degrees tilt. Reduces strain and torque of the rotator and avoids sudden block of the rotation. The integrated shock absorber further reduce vertical torque caused by wind gusts as well as mechanical shock and vibrations originating from starting and stopping the rotator. Yaesu 25M-WP set of connectors for current Yaesu rotators. 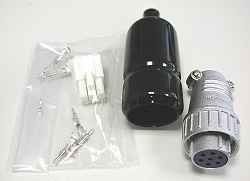 One 6 pin square connectors for the control unit, one 7 pin round connector with rubber cap for rotators. Solder connectors, suitable cable is #40010 (see below). 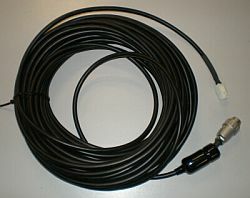 25m rotor control cable, suitable for Yaesu rotors, equipped with connectors.